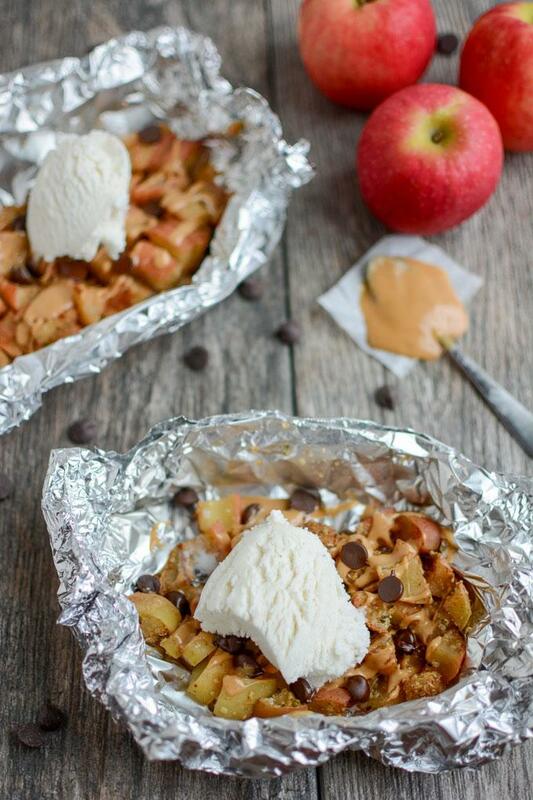 These Baked Apple Packets are a super simple fall recipe. Enjoy them with ice cream for dessert or top with yogurt for breakfast or an afternoon snack. The perfect way to end a day of apple picking. Originally published 10/2012. Photos and post updated 9/2018. 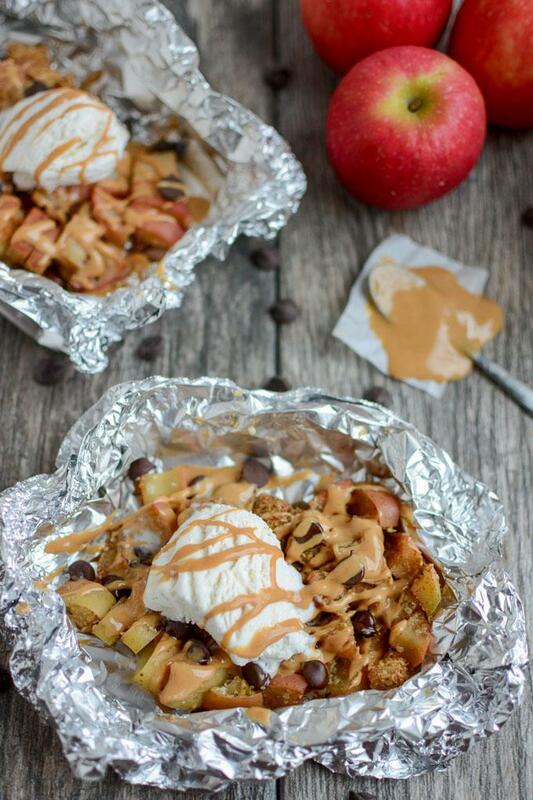 Allow me to introduce you to these Baked Apple Packets. Have you been apple picking yet this year? Or perhaps you have it on your to-do list for an upcoming weekend? 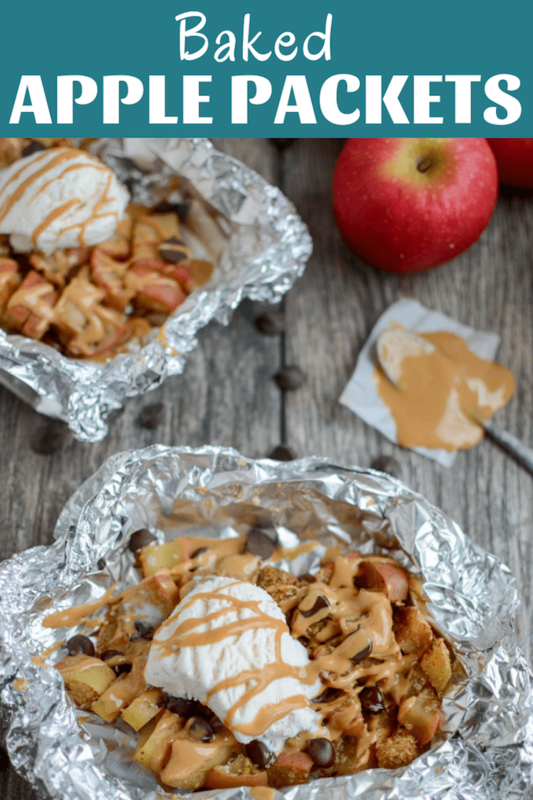 This easy recipe idea is the perfect way to use up some of those apples. I like these as a dessert, topped with ice cream….but you could easily top them with yogurt or extra peanut butter and enjoy them for breakfast or an afternoon snack. Plus they’re easy to customize. I mixed my apples with cinnamon, ground flaxseed and hemp seeds and then topped with peanut butter, chocolate chips and ice cream. You could toss yours in just cinnamon and sugar if you wanted, drizzle with chocolate sauce, top with chopped nuts or granola, add a scoop of yogurt on top etc. There’s no real recipe here because you can make as many or as few as you want. And no exact cooking time because you can cook them as long as you want depending on how soft you want your apples. AND if you wanted to, you could cook these on the grill or over a camp fire! ice cream or yogurt if desired. Place chopped apple slices in a bowl. Sprinkle with cinnamon, ground flax and hemp seeds (and sugar if desired). Split equally between pieces of foil and fold into sealed packets. Bake at 400 degrees for 15-25 minutes depending on how soft you want your apples. Carefully open each packet and top with nuts, granola, chocolate chips etc. Add a scoop of ice cream or yogurt and serve! You can also add the peanut butter before baking if you’d like! Don’t be afraid to experiment with other fruit either. I’m trying it with pears next 🙂 Peaches would also be a great option for the summer! Oh, this looks yummy! I have a plethora – gotta love that word – of apples too, so this is a great idea. Thank you! wowwwww! Yummmmyyyyy! this look ssoooo delicious! nice touch with the chocolate chips. I have butterscotch chips that would melt heavenly on this. oh ya! I’d like to make this for breakfast this morning!! This looks like something the kids would have fun putting together! We’ll have to try it this weekend. yum!! looks delicious AND easy-love that. sounds like it’s your lucky day! This looks amazing! Reminds me of apple pie without the crust! I’m definitely trying this out! Holy smack that looks good. Almond Butter, apples, and cinnamon are a fav quick snack for me. yes! peaches for the win! These look so good! I wonder if they’d work with a banana instead of apples. I know there’s a recipe out there to throw something similar to this using a banana on the grill. Mmm…I’ll have to give this one a try for sure! i think it would def work with a banana! Hello yum!!! Your Instagram pics always make me drool — so I’m always happy when you share your easy recipes! This looks like another great keeper!!! Oh i cannot wait to try this SO brilliant!! oooh i haven’t had baked apples in forever! love that you did it with slices- so much easier to eat. yum! Yum!! I saw this on instagram and was hoping you would share the recipe. 🙂 Pinning! Looks great! So easy and, I’m sure, delicious! YUM! This looks delicious. This is on my must make list. 🙂 Thanks! you’re welcome! hope you love it! I microwave apples and maple syrup and spread it over ice cream…sooo good, right? These look so delish! I’ve done something similar with bananas…yum!! pinned it. 🙂 looks amazing! YUM! A perfect healthy treat! I LOVE baked apples in the fall! OR baked pineapple chunks with cinnamon on top and a drizzle of peanut butter that gets all warm and gooey and YUMMY on top. DEEELISH!! As I was reading the recipe, I could just imagine how delicious this is! Love the idea of a packet!! Hell yes! Perfect dessert, especially for a weeknight. Thanks for sharing! Yum, so easy and healthy – I love it! OH my!!! I bet those made with a HOneyCrisp are to die for. I love fall! This is such a cool recipe, it’s the fruity version of a hobo dinner! Looks so good and I like that it’s so quick to make! and the child can help too which I love. Oh yum! My kids would love this and probably have fun making it too. Thanks for sharing! The combo of the peanut butter AND ice cream on top at the end – yum! Yum! I just made this for dinner er dessert. I put the choc chips in before baking so they got nice n melty. The pb in this is great! So good it doesn’t really even need the ice cream! awesome! i was thinking about including the choc chips next time too! Thanks for tweeting this earlier! This was my dessert. I added SFH chocolate protein to the pb because that’s all I had on hand . So good! Yum!! 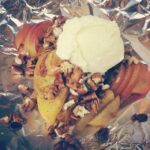 Baked apples are one of my favorite fall desserts! Just went apple picking yesterday and have SO many apples… this was a delicious treat topped with vanilla ice cream. Yum!